While tourists from Canada do not need a visa to enter Argentina, they are charged a so called ‘reciprocity fee’ to enter the country (see update above: this is now only required if entering Argentina before the end of 2017). This is a bit like an entrance fee and is based on the amount Argentinians are charged in visa fees to enter Canada. For this reason, for example, European Union passport holders do not have to pay a reciprocity fee, as there is no charge for Argentinians to visit European Union countries. The amount charged and the length and conditions of validity is subject to change, so be sure to check for the latest information on reciprocity fee requirements with your embassy before leaving for Argentina. As our last update to this page in July 2017, the reciprocity fee has to be paid online by credit card prior to arrival in Argentina and the printed receipt presented at immigration control. Failure to do so may result in you being returned to the country from which you departed. The fee is paid via the Argentinian Immigration website. Click on ‘Reciprocity Fee / Tasa Reciprocidad’. A page with explanations in Spanish and English will appear. Read the explanations and click ‘continue’. You will be taken to a Provincia Pagos Migraciones webpage (Banco Provincia is the bank that processes the payment). Next you need to select ‘sign-up’ (in the bottom-left of the page) and enter your details. Once the payment is complete, remember to print the receipt & keep it with your travel documents/passport when coming to Argentina. If you have any questions, there is further information on the Provincia Pagos Migraciones website, plus they have a phone number on that page in case you need help, or you could even download their badly translated PDF of instructions here. For the fees and length of validity at the time of writing, see below. Amount charged to Canadian citizens (at time of writing): US$ 78 for all points of entry to Argentina (now including cruise ship passengers). It is a multiple entry fee valid for 10 years (or up to one month before passport expiration date, whatever occurs first) beginning on the date the payment is made. The fee must be paid online prior to arrival in Argentina, and the receipt printed for presentation at immigration control. The fee must be paid for all points of entry to Argentina (now including cruise ship passengers) – if you are arriving into Argentina before the end of 2017 (see update notes). It must be paid online prior to arrival in Argentina, and the receipt printed for presentation at immigration control. We have heard reports from tourists coming to Argentina that the Provincia Pagos Migraciones website has been experiencing short periods of down-time and temporary errors, so if at first you don’t succeed, try, try again! Also giving it a go in different internet browsers such as Chrome, Firefox and Internet Explorer may help if things don’t work the first time round. Finally, all the above advice is intended as useful information to help visitors to Argentina, however the situation described at the time of going to press may well change and is out of our hands, so although we will do our best to post updates, please do check the official Argentine immigration website for the latest information, and your local embassy/consulate. It is also a good idea to check with your travel agent and/or airline before traveling is you have any doubts. 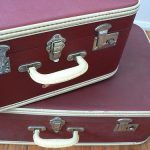 What to pack for a trip to Buenos Aires Unsure what to pack for your upcoming trip to Buenos Aires? Here we've compiled a list of what to bring in your suitcase, and what to leave at home. Don't leave home unprepared for your urban adventure! Buenos Aires Safety Tips We recommend that you read this general safety advice before coming to Buenos Aires, which includes tips on what to carry with you around the city, local scams, taxis, airport transfers and more. 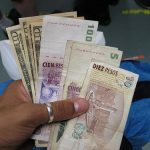 Getting the best exchange rate for your dollars in Buenos Aires Recent government reforms placed limits on how locals & visitors trade foreign currency. You can get the best bang for your buck by bringing US Dollars & selling them wisely. 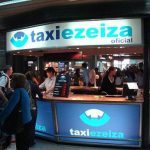 Taking a taxi in Buenos Aires Traveling by cab in the city of Fair Winds is an easy and fairly affordable option. 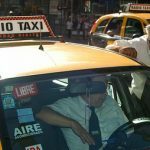 Read here everything you need to know about taking a taxi in Buenos Aires, from rates to routes to common scams. What is the weather like in Buenos Aires? Get the latest weather conditions in Buenos Aires, and a 5 day forecast. Buenos Aires has generally quite mild weather year round, although the peak of summer may be a bit hot and sticky for some. Regarding the reciprocity fee for U.S. citizens arriving in Argentina. My wife and I paid for the reciprocity fee a couple of years ago in EZE airport and a sticker was placed in our passport they said good for 10 years. I am assuming that it is still valid for the period indicated. Am I correct? It was my understanding that the fee was only collected at the airport and not at other entry points to Argentina including cruise ships. Now from your blog everyone entering from anywhere would have to pay this amount. Last February we took a cruise from Valparisio around South America to Buenos Aires. Even though we arrived in Santiago and spent one night prior to boarding the cruise ship we had to pay the entrance fee in Chile. Now from you post it sounds like cruisers will have to pay the fee in both Santiago and the first port they arrive at in Argentina. Wow this is gonna get expensive!! …however now, from June 30th 2013, the fee will ALSO be charged for those arriving in cruise ships, even if only coming into Argentina for one day. As there are no cruise ships coming into Argentina this month (it is outside of cruise season), we have presented the information in this post as if writing after June 30th, to save having to update this page in a few weeks time. Things are indeed getting more expensive for visitors from the USA, Canada & Australia, however the reason this charge has been put in place is due to the visa fees Argentines have to pay to apply to visit those 3 countries. Not that we are saying this legislation is right or wrong, just understandable… although frustrating for people who work in tourism like ourselves. We hope you and others still think that Argentina is worth visiting! It’s a beautiful part of the world. 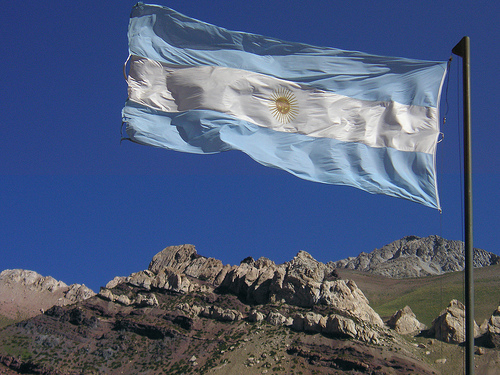 I visited Argentina in March 2011 (from the USA) and paid the reciprocity fee. I have a sticker in my passport that shows this being valid for 10 years. I will be traveling back to Buenos Aires this week. Now with the recent changes in payment requirements, do you know if my 2011 payment is still valid? Do I need to pay the fee again? Thanks for your comment. Since you paid the reciprocity fee in March 2011, are from the USA and have the sticker in your passport to show it is valid for 10 years, it is my understanding that you won’t have to pay the fee again – the reciprocity fee for US passport holders is valid for mulitple entries for 10 years. You will need to show the page in your passport at immigrations with the sticker saying you have already paid the fee. Enjoy your trip to Buenos Aires! Love your website – thank you so much for all the information. I am taking notes madly, although being very heat sensitive I don’t think I can do a walking tour in January! My question about the fee here is if you know whether the $75 Canadian one also covers visiting various Argentine ports on a cruise? We will have to get either the $75 or $150 one, as we fly into BA a couple of days before the cruise leaves, and I understand the $75 one covers us if we were to go to say Uruguay and then back to Argentina. Will it also cover us docking for the day in Puerto Madryn or Ushuaia, do you know, or do we need the $150 one? Thanks for your comment. I’m glad you like the website and find the information helpful. 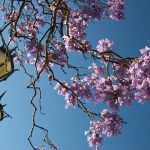 In reply to your question, it is my understanding that provided your trips to and from Argentina and neighboring countries (Uruguay, Brazil, Chile, Paraguay and Bolivia) are within 3 months of your initial entry into Argentina, you will just need to pay the single entry fee (ie, the US$ 75 fee). As for stopping at Argentinian ports during your cruise – as long as the stops are not more than 90 days after your initial entry into Argentina it seems to me that going from one Argentine port to another with the single entry fee would be fine. However I am not certain this is the case so I would advise you to check with your cruise company to make sure. If they do tell you differently please let us know so we can pass on the info here. Have a great time in Argentina! When did Argentina start charging a reciprocity fee for Americans? I traveled to Argentina in 2008 and am about to go again. I am wondering if I will need to pay the fee? Argentina started charging this fee in 2009. If you have not paid the fee in the past, then you will definitely need to pay it now in advance of your journey, as if not you will either get denied boarding the plane, or if you make it to Argentine immigration control here, there s even the possibility that they will put you on the next flight back (however small a chance it is, you don’t want that possibility I’m sure). Thank you for your comment and I hope this advice is of use to you. Please let us know if you have any other questions. I really appreciate your quick reply and the information. I was able to pay the fee online. We are planning on spending time in Mendoza, Argentina and then flying to Santiago, Chile for a few days. Will we be required to pay the reciprocity fee for each country? For further questions regarding the Chile fee, I would recommend searching for/contacting a website or blog about Chile. Happy to help with any other questions you have about Argentina in this respect. I went to Argentina in October 2013 and paid the reciprocity fee online. I’m returning to Argentina in April 2014. In my passport is an entry stamp and the date. I can’t seem to get another copy of the paid fee through the fee/website. Is my passport stamp sufficient? Thanks for your comment. This is a tricky question and I am not an expert, so you may be best to check with your consulate. However, from what I have read, it seems you WILL be required to produce a printed receipt with a bar code, along with your passport stamps. From reading the FAQs on the immigration website, it seems this information would have been emailed to you at the time of payment, so perhaps you could find this email and print it? Enter the product http://www.migraciones.gov.ar, reciprocity fee, and mail with your username and password to access the page in “my forms” and print your ticket payment. I hope this helps. Good luck and enjoy your trip to Argentina. my client has lost the copy for proof of Reciprocity Fee payment . he made the payment in 2014 , how can he get a copy ? Sorry to hear about that. I think in this case, the only people who would know what to do are at the nearest Argentine embassy to you. You should be able to find those details searching online. Any advice we give would not be the official line and we do not want to mis-advise anyone, especially when it could potentially cause problems with entering the country. If we arrive in Buenos Aires and for whatever reason our reciprocity is not valid or is not correct, can you get reciprocity at the airport? Thanks for your comment. As far as we are aware, there is no way to pay the reciprocity fee at the airport anymore – it has to be paid for online in advance. Do you mind if I ask why you think your reciprocity fee might not be valid or correct? Perhaps then we would be able to help more. However, the only way to be 100% sure (despite whatever advice you read here, or we tell you, or you read elsewhere online) is to contact your nearest Argentine consulate and ask them. I’ma US citizen that was born in Argentina. Do I stillneed to pay the $160 fee when traveling to Argentina? Thanks for your comment. As ever, for such specific questions I would always check with official groups, in this case probably an Argentine embassy in the US. However, I would assume that if you enter Argentina on a US passport, you will need to pay the reciprocity fee. If you enter Argentina with an Argentine document, you won’t have to pay the fee. I was one of the first to enter Argentina and pay the reciprocity fee. I have an entry stamp in my passport, but no sticker that says that I paid it. What can I do to not have to pay it again? I should also add that I entered after leaving Chile through Paso Jama, and will be entering again shortly. I really hope that I do not have to pay again. Hello Chris! Thanks for your question about the reciprocity fee. We have no direct experience of this. We have heard (from friends of friends, that kind of thing) that if you have an entry stamp in your passport from a visit to Argentina in 2009 or later, it should act as proof that you have paid the reciprocity fee, that is valid for 10 years for US citizens (I am assuming you are a US citizen? ), so you would not have to pay again. HOWEVER, as we have not had direct experience of this ourselves (and neither do we have a close friend or trusted acquaintance who has experienced this situation), and there is no official documentation either way on the subject that we can find, please do not take this as certain. Our advice would be to contact an Argentine embassy/consulate before you travel if you wish to be sure. Of course, the safest course of action would be to pay the reciprocity fee again online ahead of your travels, but obviously that may leave you feeling like you potentially wasted that money unnecessarily. But, if you are unable to get a definitive answer before you travel, it may be worth it for the peace of mind that you will not be turned away at the border. I hope this answer helps you in some way. From looking into this further, I would suggest that, if you have only an entry stamp (90 day tourist visa) in your passport from your previous visit, and no sticker to prove that you paid the reciprocity fee that time, then you should definitely pay the reciprocity fee again. It is highly unlikely that you would even be allowed on a plane to Argentina without documented proof that it has been paid. The one exception to this would be if you are able to contact the Argentine embassy and get them to send you proof that you paid the fee before. We will be traveling to BA on Dec this year!. How much they charge for the reciprocity fee?. Thank you. The cost of the reciprocity fee depends on whether you are from the USA, Canada or Australia. You can find all the details in the blog post above. Have a good trip to BA! I was born in Argentina and now I am American citizen. I have to travel to Argentina. Should I pay the Argentina Reciprocity fee? What happens if between docking in Argentina’s ports you stop over in the Falklands? Does that make the Single entry fee invalid? I have to say we don’t know the answer to that. I would check with the relevant Argentine embassy/consulate, as only they will be able to give an official response. I have a stamp and bar code in my USA passport from a reciprocity fee paid at the airport in Buenos Aires in 2012. I am currently in Chile, and planning a bus trip to Ushuaia in Argentina. The bus Chilean bus company will not assure me that the Argentina crossing will take place if I do not have a receipt for the reciprocity fee. Is this true? do I need the sticker and the receipt? I do not have a receipt from 2012. I am from New Zealand and assume that I am exempt from the Reciprocity entry fee. That is exactly what I read in the Argentine consulate site as well. New Zealanders do not have a reciprocity fee. Enjoy your visit! Me & my friend are Canadians travelling from Lima to Argentina , we enter to view Argentina side of Iguazu falls ,exit to view Brazil side of Iguazu & Re entering back to Argentina the same day. Do I apply for the one entry fee of US$75 reciprocity fee? Am I right? A great Thanks for your help! Thanks for your question. It actually now looks like the reciprocity fee for Canadians entering Argentina has been changed, and it is US$72 and just one type, which is valid for multiple entries over 10 years (or up to one month before passport expiration date, whatever happens first). We have updated this webpage accordingly. You only have that one option for a reciprocity fee for Canadians coming to Argentina now. Please also bear in mind that as Canadians you will need a visa (not reciprocity fee) to enter Brazil, unless you are visiting between 01 June until 18 September 2016, during which time the visa is waived for certain countries (including Canada & the US), to encourage tourism before and after the Olympic Games. I am an Australian resident and am flying from Santiago to London. There is however a direct flight to London from Buenos Aires. If I fly from Santiago to London via Buenos Aires (but don’t actually leave the international airport), am I still required to pay the reciprocal fee? Any advice or help would be greatly appreciated!! Thanks for reading and for your comment. It would depend on whether you are just in transit at the airport in Buenos Aires, or whether you will have to go through immigration & customs etc on arrival, and then check in and go back through immigrations & customs etc again. If it is the former then I would expect you would not need to pay the reciprocal fee. However, if it is the latter then I would expect that you would. If you don’t know what you’d be doing at the airport then I would first ask your airline/s if they know, and secondly I would recommend, as always, checking with the Argentine embassy in Australia for their official advice. Please also bear in mind that there are two airports in Buenos Aires – AEP and EZE. If you happened to arrive into AEP and leave from EZE (for example), then you would definitely have to pay the reciprocal fee. I hope this comment helps you. Best of luck! Are you a citizen of Argentina too? As far as I know, it is the law of Argentina that citizens of Argentina must enter on an Argentine passport. If you are not a citizen of Argentina, and travel on an Australian passport, then you will be treated as an Australian and therefore will have to pay the reciprocity fee. I am a Canadian visiting South America. I will be flying from Uruguay to Paraguay. The only option for this flight is with a layover in Buenos Aires. As these are domestic flights, do you know if I need to pay the reciprocity fee? I found online that if you leave the immigration area from an international flight then you need to pay it,but I couldn’t find any details on whether it needs to be paid on a domestic flight layover. As far as we are aware, in theory any Canadian entering Argentina via any method has to pay the reciprocity fee, even if only a layover. In practice it may be possible to avoid having to pay it if you do not need to go through Argentine immigration when arriving into Buenos Aires from Uruguay to get to your flight to Paraguay. But we can’t say whether you will need to do that or not – I would say that you might need to, because despite you saying these are “domestic” flights, they sound like international flights to me and often in Argentina you have to go through immigration for those even on a layover. I think the safe thing is to pay the reciprocity fee just in case, to avoid your travel plans being messed up. That said, the best thing to do in this case is to check with the Argentine embassy or consulate in Canada. Best of luck – and enjoy your travels in South America!